Solid wood provides a deep richness and beauty that most homeowners desire. The look and feel of it, the warmth, the luxury – all desirable traits for the focal point of a home. Unfortunately, wood doors come at a price. Sun exposure, for example, is very prominent here. Most wood door manufacturers do not provide a warranty for fade resulting from sun exposure, so homeowners are left without recourse for an inevitable problem. What if you could have the richness and beauty of wood, without the maintenance? You can! Fiberglass doors are a popular alternative to wood doors. Fiberglass doors are known for their extreme durability, strength, low maintenance, energy efficiency, and their ability to take on the richness and beauty of solid wood…a solid wood that never fades. If you’re interested in getting the most out of your money, we recommend fiberglass entry doors. They are built to last, provide a better cost-benefit ratio, and add much more value for your money than wood doors. 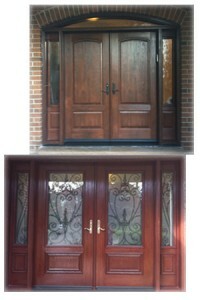 Door Gallery is proud to carry the three leading brands of fiberglass entry doors worldwide. Click here to see our brands. Still a lover of solid wood doors? Give us a call anyway! Door Gallery is glad to answer any of your questions and will assist you, even if you decide a wood entry door is for you. Our friendly, knowledgeable staff will gladly help you reach the best decision for you and your home. Contact us today with your questions, or to schedule an appointment. We look forward to assisting you!